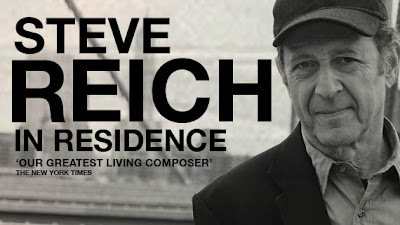 Sydney Opera House presents THE COMPOSERS: STEVE REICH IN RESIDENCE. A Celebration with Synergy Percussion and eighth blackbird in the Concert Hall at the Sydney Opera House. STEVE REICH IN RESIDENCE is part of the Sydney Opera House entrepreneurial development wing program. It is presented under the title: THE COMPOSERS and is curated by Yarmila Alfonzetti, the Producer, Classical Music, Sydney Opera House. A CELEBRATION is one of three public events that were presented. During the week there had been an IN CONVERSATION with Mr Reich, and, on the same day as A CELEBRATION, there had been a CHAMBER CONCERT featuring work by Reich,Ligeti and Riley. A CELEBRATION was a very generous four-hour concert (with intervals), beginning at 6pm, that covered work created from 1970 through to 2009. The performers engaged in this concert were from Synergy Percussion, eighth blackbird, Ensemble Offspring, Halcyon, ACO Qantas Emerging Artists: ACO2, and Sydney Symphony Sinfonia conducted by Roland Peelman. I am a late comer to music appreciation and I only became aware of Steve Reich's work, maybe, ten years ago. This was along with a more conscious absorption of Philip Glass and John Adams, Michael Nyman, Terry Riley and some contemporary Australian composers (the latter, mostly, through concerts with the ACO). I am a fan. I do admit that seeing the music played is a much easier way to fully appreciate this composer's work. It enhances the total experience. This is the second live concert given by Mr Reich that I have had the pleasure to hear and SEE. Interestingly, Mr Reich calls his work post-minimalist, but he did begin A CELEBRATION with a performance, himself, with another musician of CLAPPING - a two handed exercise in rhythmic co-operation. Inspiring simplicity – and definitely 'minimalism'. There was a frisson of adoration, if not idolatrousness, given to Mr Reich's presence, from the audience (a full house), which then permeated the rest of the performance. Indeed, for me, it was the palpable earnest concentration of the audience throughout the whole of the concert that gave it an almost unique tenor,as experience for me, in concert. The breathless focus of concentration and the amazed visual appreciation of the musicians at work, by the audience, was something that I have never fully experienced at concert before (except, come to think of it, at the Sydney Symphony "Ring" recitals a few years ago ! Other fanatics? Ha!) This was urged, I reckon, from the example of the discipline of the musicians, who appeared , even with their entrance to the stage, to the gathering to their instruments, the playing, and down to the applause acknowledgement and stage exit, a remarkable attitude of sheer professional intent. No lounging on, or putting down of long necks to get into the 'zone' that I have had to endure, say, through the concerts, sometimes in the VIVID seasons. Instead a pure professional and deep respect for the music and its challenges. ... a distinctive personality emerges - lean in form, logical in movement, yet marked by some indefinable mixture of beauty and sadness. The music has a soul of its own, which may fascinate and mystify the composer as much as it does the rest of us. An early work, FOUR ORGANS (1970), played in the second segment of the concert, is one of his works that, and I feel sure a great number of my audience will testify to, that will either cause you to ultimately jump out of your seat and run around the room screaming, "Get me out of here! ", (having being driven crazy), or patiently surrendered too - to a place of objective appreciation of the intellectual goal of the work. This is compensated, ultimately, by the wondrously deep immersion that MUSIC FOR 18 MUSICIANS (the last work in the concert) gives one. The complex tonal and pulsing repetitions, imaginatively took me into the throb of the city noise of a great city such as New York; it awoke a connection to Stephen Sondheim (especially in his work COMPANY - another New York placed work); and too an aural conception, layer upon layer upon layer of shifting, provoking sound that was an immense 3D and Imax sized hallucinogenic trip, kineasthetically equivalent to my journey in the recent TRON: LEGACY cinema experience. Very, very exciting and satisfying. The four hours flew by, the generous breadth of the program and the magnificent performances by all of the musicians made a concert experience well worth the time spent. I did feel part of a universe of great potential - this 'music of the spheres' , from the 'spheres', placed me comfortably in my world - at least for a little while. Congratulations to all involved. There was a feeling of a deep maturity of appreciation by this audience for modern classical music. It was magnificently rewarding. The fact that Mr Reich was guiding the performance, personally, enhanced the feeling of privilege one had during the concert to be near greatness.